I spent my first 20 years sailing the River Crouch almost every week and at the end of that time I guess you could say I knew the area very well. Two years ago we moved house to Suffolk and I moved my home base to the River Deben. 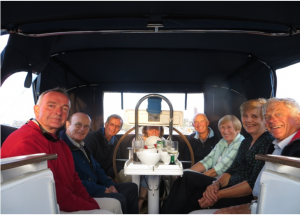 So it was now a bit strange to contemplate returning to the familiar Crouch for the Autumn Dufour Rally which this year was to be held at Burnham Harbour. We planned to arrive at Burnham by mid afternoon on the Saturday. However as I can only escape from my mini harbour at the top of the tide and it is almost impossible to navigate the Deben in the dark the Saturday arrival time meant that we had to leave with the high tide on the Friday at about 15.00 hrs. 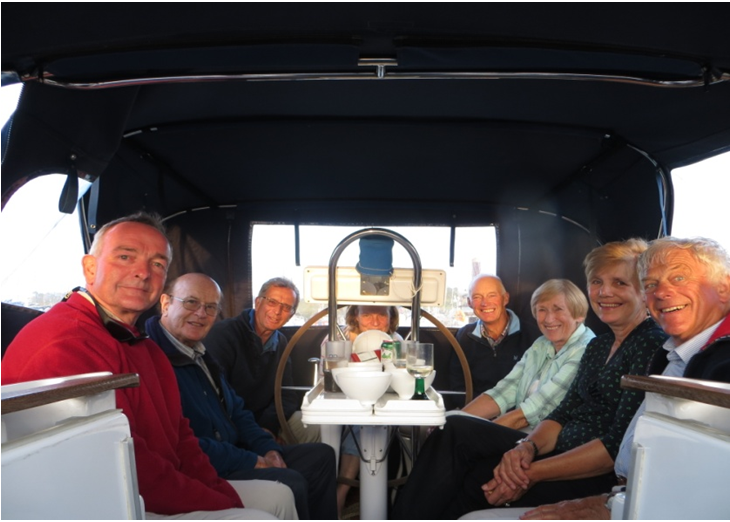 The wind was F3 – 4 coming predominantly from the east so we could sail down river and then much of the way westward towards the Walton backwaters where we planned to anchor on the Friday night. Everything went to plan and we had a relatively restful night. Although the backwaters anchorage is relatively deep unfortunately the entrance channel is quite shallow. To avoid being trapped in we decided to leave at 7am on the Saturday morning which should have given us a comfortable 0.5 m clearance but it was on a falling tide. We woke up around 6.30am and all was going to plan till it came time to lift up the anchor. You can imagine the shock and concern when the ‘up anchor’ button on the windlass failed to work. The down button worked fine! Unfortunately last night we had let out more or less all of the 25 meters of heavy duty chain to ensure good holding and a comfortable night. I tried to bypass the switch to get it to work but that didn’t do it. Bob my strong and trusted friend elected to pull the whole thing up manually and believe it or not he actually managed it. Unfortunately this all took some time and it was a significant delay on our planned escape timing. We were now over half an hour late and the water clearance on the entrance channel was now down to less than 12 inches!! The escape from the anchorage is predominantly eastward so it was engine on and make best speed before the falling tide trapped us. Fortunately we made good our escape reaching Pye End buoy – the safe watermark without further mishap. It was a great relief to turn South – put up the sails and follow the Medusa Channel then into The Wallet –cross the Spitway and up the Crouch. With the wind at our backs and the tide well and truly with us we were making 8 knots over the ground. With these favourable conditions we arrived at Burnham harbour at 14.00 hrs somewhat earlier than we had expected. The other boats, ‘Cest Moi’ and Stargazer ll were both in the harbour before us – so we were still the last in! After a walkabout in Burnham town and meeting up with some ore of our regular crew members ??? and ?? forgotten we all met up for drinks and nibbles on boards Stargazer ll and time to catch up with old friends:-Before going to evening meal we all decamped to Thistle Dhu where we now have on board our own home movie system that projects onto a large screen – Having recently returned from the Dartmouth regatta we were able to show our videos capturing much of the various activities from the 3 day event. 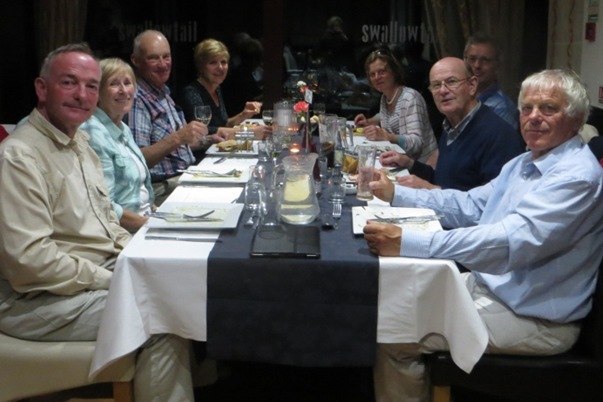 Then it was on to the Swallowtail – the local restaurant – for a pleasant meal. Although only a small group of us intrepid Dufour owners we enjoyed a good meal, albeit that the service was slow to say the least and the good the company of our friends. The planned return for us to the river Deben required a 6am start. Ug! The wind was still coming from the east – in fact we were experiencing F5 gusting F6 from the NE which meant that it was on our nose all the way home. And worse still, to avoid the usual banging and shuddering from the oncoming waves our average speed through the water had to be kept no faster than 3.5 kts. Wallasea Island is on the south of the Crouch and in the two years that I have been away a new quay has been developed to handle the spoil from the Cross Rail project’s tunnelling. It looks like this process now operating is running on a 24 X 7 basis. We had to share the river with one full ship coming up river and another empty one coming out beside us. It is quite a changed environment for those of us that used to know the river well. Progress was slow and steady out of the river and back through the Wallet with the Gunfleet Wind Farm to our south. With the tide helping us out of the river our 3.5 knots or so translated to about 5 knots over the ground so reasonable progress was achieved. However the tide changed when we were only about five or so miles from the Deben River mouth. Our 3.5 knots then translated to only 2 knots over the ground! What an incredible difference this was compared to the 8 or so knots we had been achieving yesterday in very similar conditions but going the other way of course. Careful planning and recognising the importance of both wind and tides is so important to us sailors. We arrived at the Deben mouth about 30 minutes earlier than the deadline we had set. The river was relatively calm so we were able to set a more reasonable 5 knots on the engine and therefore arrived at my mini harbour still on the rising tide -so could park with a little time to spare. Still light??! !